FLIR Systems Awarded $2.6 Million Contract for Black Hornet Personal Reconnaissance Systems for United States Army Soldier Borne Sensor Program | FLIR Systems, Inc.
WILSONVILLE, Ore.--(BUSINESS WIRE)--May 30, 2018-- FLIR Systems, Inc. (NASDAQ: FLIR) has been awarded a $2.6 million order from the United States Army to deliver FLIR Black Hornet® Personal Reconnaissance Systems (PRS). The units delivered under this contract will support squad-level surveillance and reconnaissance capabilities in the Army’s first batch order for the Soldier Borne Sensor (SBS) program. This contract expands the use of FLIR’s Black Hornet PRS for military surveillance and reconnaissance programs. 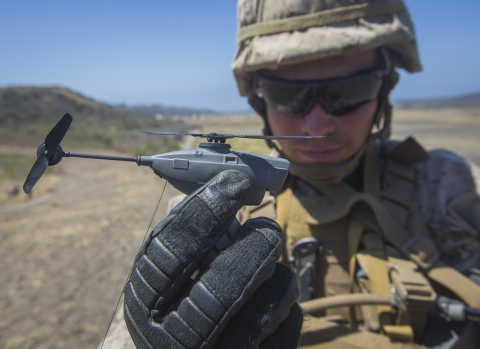 FLIR has delivered the Black Hornet PRS systems to 30 nations around the world, and the U.S. Army will receive the latest generation of the system under the SBS program. Deliveries of these systems will take place in 2018. For more information about the FLIR Black Hornet PRS, please visit www.flir.com/blackhornet (U.S.) or www.flir.eu/blackhornet (Europe and Asia).